Countrybike Ltd is a new bike hire business with a difference. 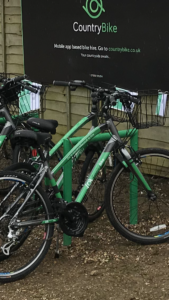 We offer the ability for the public to hire bikes situated around the countryside in the car parks of local businesses via a mobile phone app and internet/bluetooth enabled locks. The aim of the company is to add reasons to visit, explore and support local rural communities, whilst promoting a stress beating and healthy lifestyle choice in using the service itself. We are proud of our 21 speed, Hybrid Aluminium framed Dawes bikes which are perfect for exploring the local countryside. For almost 100 years Dawes has been one of the finest bicycle brands in the UK. The Dawes factory made bikes for the armed services during the war and has since supported a whole host of British racing cyclists over the years both on and off-road. We also provide a delivery service where bikes can be delivered to and collected from certain locations. 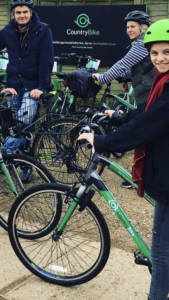 This service is available when ordering multiple bikes for a full day or longer and the delivery point is within a 10- mile radius of Royal Tunbridge Wells. In addition to the Dawes bikes, we also provide children’s bikes for hire. More sites will be open soon.